May 2, 2014--Fini! The last two sections, 7 and 8, are complete and this project is now ready to be made into a box pillow. If I can find an upholsterer who will sell me the right sized piece of foam, I'll make the pillow myself. 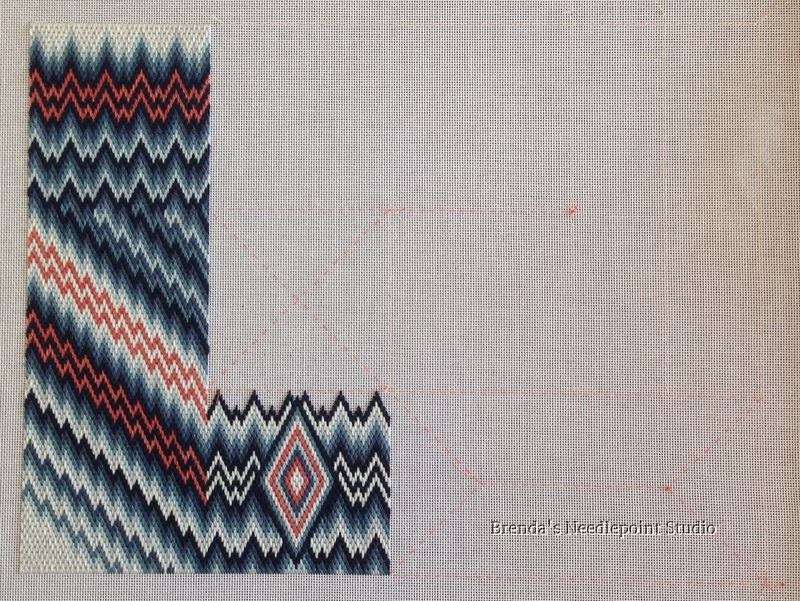 I really enjoyed working on this and learned so much about bargello, especially when it comes to moving from one section to another--merging your patterns, so to speak. The instruction manual is truly an excellend resource. Thanks Liz for offering this course through ANG! March 30, 2014--Section 6 is complete and the missing stitches on Section 5 filled in. Love how it reminds me of a kaleidoscope. Discovered that I was 2 threads off at the bottom of Section 5 and used Liz's trick of doing the fill-in stitches over 6 threads (instead of the usual 4) to make Sections 5 and 6 meet. Liz did this at the bottom of Section 6 to meet Section 3. Worked beautifully. January 30, 2014--Section 5 is mostly done. I'll complete the bottom after I begin Section 6--wanting to be sure of my count. Must now put this project down for a few months due to other commitments, but look forward to working on it again. January 5, 2014--Section 4 is now done and I've reached the half-way point. The instruction manual by Liz Morrow for this project is chock full of information and will make a wonderful reference for future bargello work. 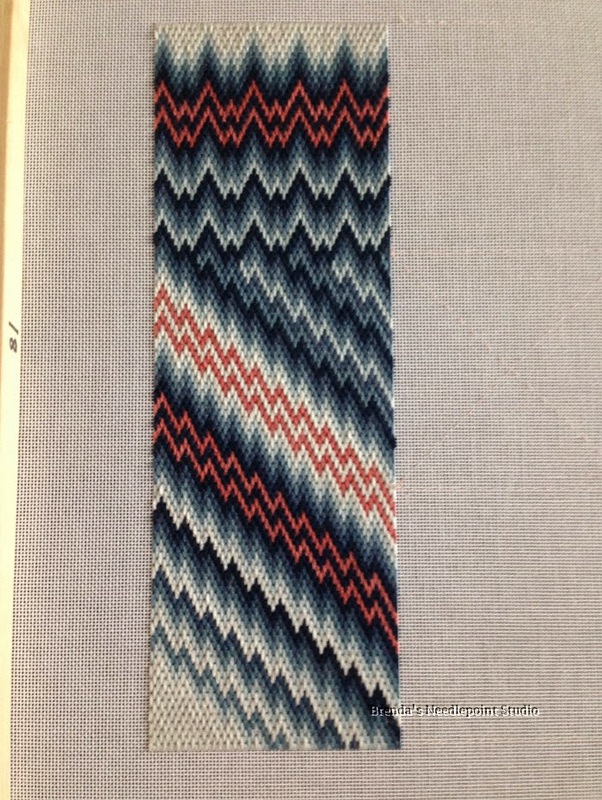 I see all kinds of bargello designs by moi in the future. 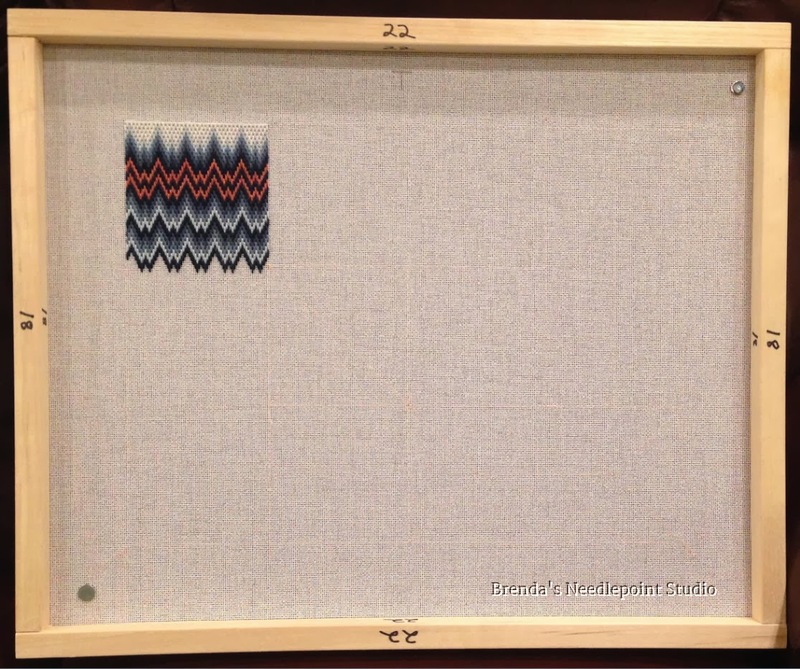 December 27, 2013--Just finished Section 3 and moved my horizontal and diagonal basting lines by 2 canvas threads to correct the error I made in Section1 (discussed below). I'm not sure if I've miscounted, but had to make a small change in the instructions for Section 3 regarding what stitch to do first. It isn't much of a change--all I did was move the basting indicator (small dot at top of Diagram 27) over 1 thread to the left (this change now agrees with the basting line for Section 2). After doing so, I then began my stitching 1 thread over to the right. Now everything fits where it's supposed to (see photo below showing these changes in the instructions). Still enjoying this project immensely. The next section is large and looks like fun to do. Hope to start working on it soon. December 18, 2013--Section 2 is done. This was a large section to complete, but once the pattern was set up, it was a dream to stitch and didn't take long. Love those over 4 stitches. Liz suggested trying different color patterns, but I chose to stick with the plan since I'm not sure there would be enough thread to do something different. Anyway, I love the color pattern as designed--it's a treat for the eyes. PS--Since Section 1 was started "upside down", I inadvertently began two threads down from where I should have, so now I need to rebaste Sections 3 - 8. Not a big problem and glad I realized what happened. I'll just need to add two threads of stitching to the top of Sections 4 and 5 to equal Section 1. You can see in my picture of Section 1 Closeup that there's an extra row of 2 threads stitched on the top. December 9, 2013--I'm loving this project! So far all of the basting has been done to mark off the sections (hard to see in the picture--used very light pink thread) and Section 1 is complete. The shop where I purchased my threads did not have Silk & Ivory as recommended by Liz, so they suggested Planet Earth and Vineyard Silks. The lightest and darkest of my threads are Planet Earth and they cover beautifully. Perfect for this project. The Vineyard Silks...not so much. Others have written on the class Yahoo Group List, confirming this is NOT a good substitution (thanks Melita for your photo). However, in an email to the group, Liz suggested a "looser twist" or tension if using threads that cover less well, so I'm doing that with pretty good success. The picture below was taken at a slight angle and, because my tension is loose, there's a loft in the threads, so the coverage looks good (for the most part). Since I don't have an LNS, I'm sort of stuck with the thread purchases I made before I learned of this problem. I really liked Liz's suggestion to begin the pattern in the middle, dividing the thread in half, working one side from the middle to the right, then the other side from the middle to the left. My thread skeins were easily cut into 40" lengths, so this was perfect. Had no waste knot to start and just enough tail on each end to bury into threads on the back. Since I used only half of the length for each side, there was less drag and wear on the thread through the canvas. This is a huge project--on 18 x 22 stretcher bars. Will have to be extra careful not to knock over my glass of wine. November 20, 2013--Just purchased my threads for this project... was unable to find Silk & Ivory as recommended by Liz. However, the wonderful personnel at Creative Stitches in Dallas, TX (where I'm currently visiting my sister) suggested Vineyard Silks and/or Planet Earth Silks. 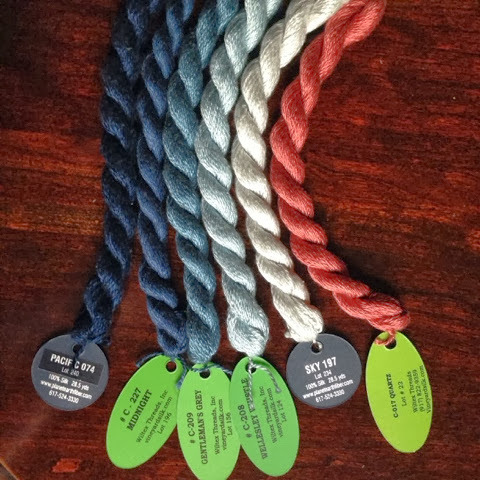 Below is a picture of my color choices. The instruction manual has already arrived in the mail and am looking forward to starting the class on December 1st. 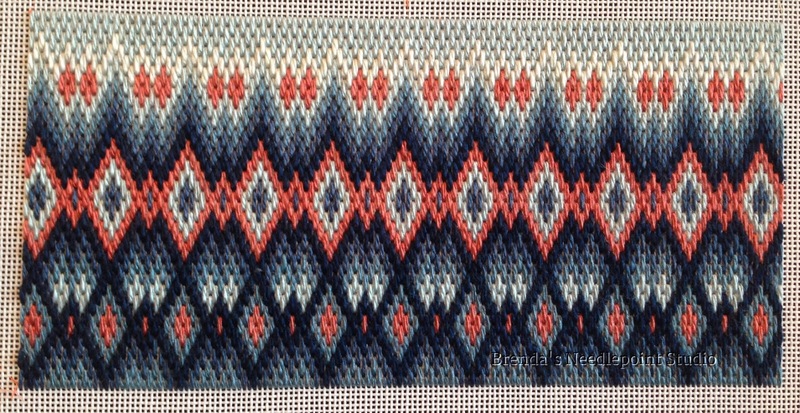 September 9, 2013--Have just signed up to take Liz Morrow's Bargello Techniques Correspondence Course through ANG's CyberPointers Chapter. 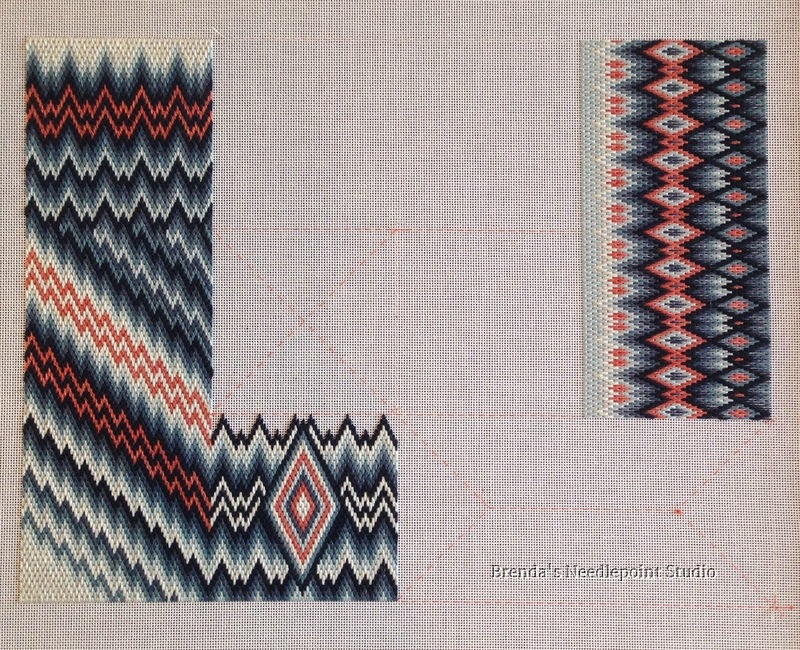 I love bargello and have had few opportunities to really learn about these types of stitches. 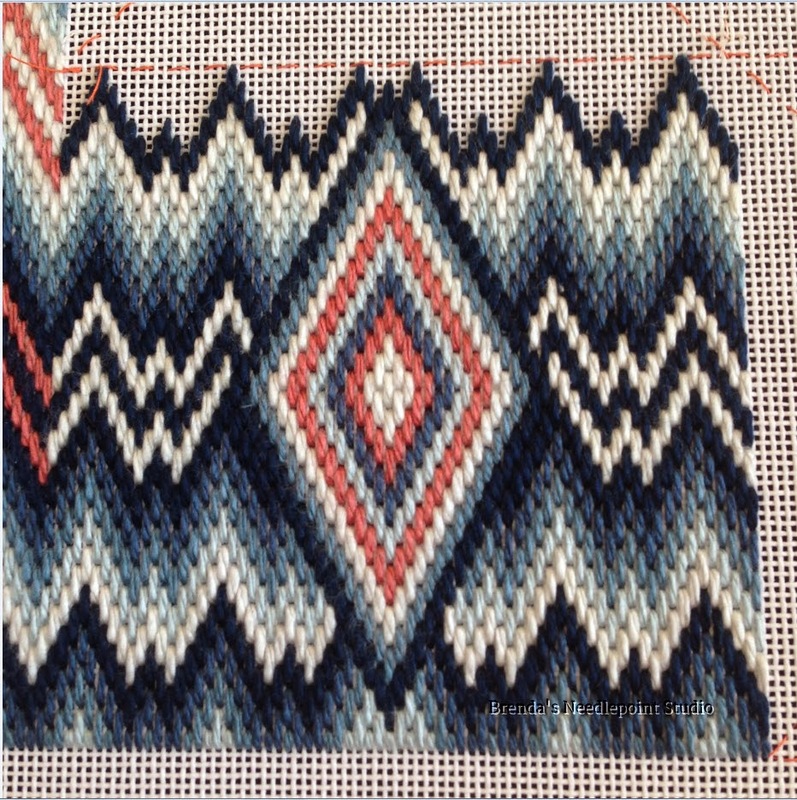 Liz is a wonderful designer of needlepoint bargello and am keeping an eye on certain of her new projects hoping she'll offer them as classes in the near future. See the tab above called In Process Projects for a project photo done by Liz for the class. I signed up as well and am already contempating a color scheme! 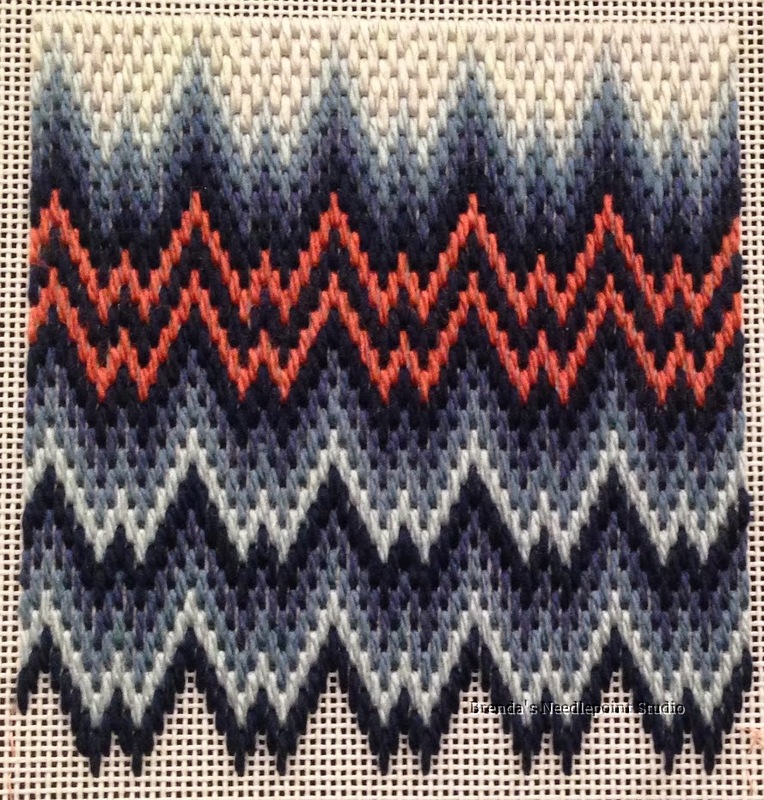 I need more projects like I need another hole in my head, and I have several bargello ones already, but Liz's designs are great, and this one looks like a lot of fun, so I'm predicting that I will sign up as well! Looks great Brenda! The coverage with threads you used looks great. And, a pillow will be good. 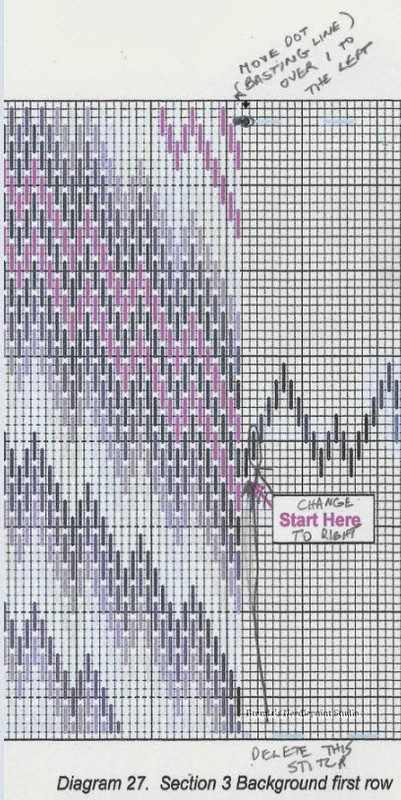 Are you ready to design your own Bargello piece now? Melita, Yes, I would love to design my own bargello piece and am formulating designs in my head at this time. I see a purse, book cover, frame weight, and other small types of projects. 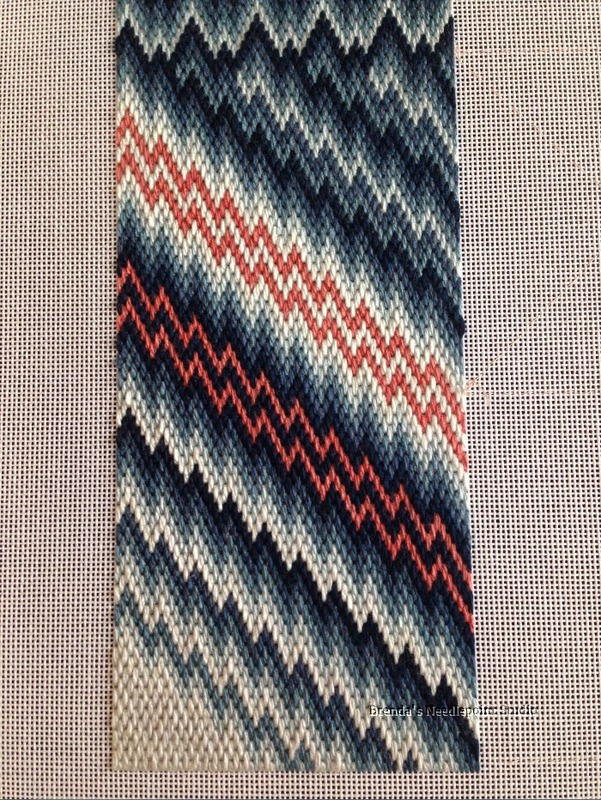 Love the colors in your bargello techniques project.